Downtown Grand Rapids becomes a "2030 District"
GRAND RAPIDS, Mich. (WZZM) -- The City of Grand Rapids is taking a big step toward becoming more energy efficient. 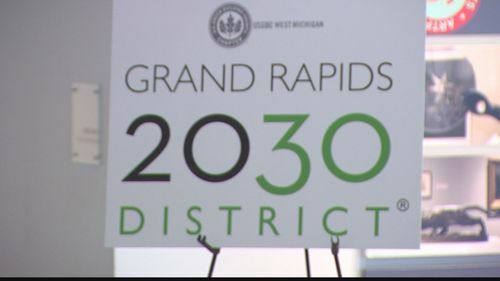 Monday morning, Grand Rapids was officially designated a 2030 District city. The public and private partnership involves property owners and operators in downtown Grand Rapids. The 2030 Plan is a long-range policy to reduce energy use within the district, which covers nearly 10 million square feet of downtown real estate. Grand Rapids is just the 11th city in the nation, and the 12th worldwide, to establish a 2030 district. "This is important to Grand Rapids as a city," said Grand Rapids 2030 District director Cheri Holman. "We've always been a leader in sustainability. This is just one more way to spread our wings and prove that we can do this." The Grand Rapids 2030 District aims for a 50-percent reduction in energy use, water use, and transportation emissions over the next 15 years.